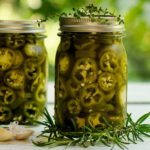 A recipe for and how to make refrigerator pickled jalapenos with herbs using fresh jalapeño peppers, fresh herbs, garlic, and peppercorns. Place 1 tablespoon of herbs, 1 chopped garlic clove, and 10 peppercorns in the bottom of two 1-pint mason jars. Cut jalapeño peppers into 1/4- to 1/3-inch slices. Discard tops and stems of the peppers. Add jalapeño slices to the jars, pressing down to pack them tightly. Bring the vinegar, water, and salt to a boil in a saucepan. Cook until salt is dissolved. Carefully pour the hot liquid into the jars to cover the peppers. Cool to room temperature. Put the top lid and ring on the jars. Chill. Allow to marinate for 3 days before using. Time stated is hands-on and does not include marinating for 3 days prior to using.